Chorizo stuffed Cornish hen, pinto bean, smoked bacon and pequin chili ragout, butternut squash puree. Seared Alberta beef tenderloin with grit cake, winter succotash of black beans and root vegetables, ancho butter. Meyer lemon panna cotta, poppy seed financier, tangerine soup, grapefruit tequila sorbet, licorice meringue and grapefruit cavier. 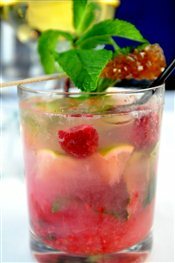 Bacardi '151' overproof rum, fresh apple juice, muddled raspberries, mint and lime. Roasted beet carpaccio with goat cheese mousse and black currant pearl, fennel cress, walnuts and maple glaze. Yellowfin tuna seared rare with baby tomatoes, olives and artichoke vinaigrette. Pistachio crusted duck terrine with blackberry and pink peppercorn gelee, orange carrot puree, chervil and brioche points. Seared rainbow trout with carrots, fennel and kohlrabi in a manila clam saffron broth with beluga lentils.